Hear that gagging sound? It’s Norwegian-Americans attempting to connect with their heritage. It happens every year at this time; thousands of people choke down an infamous concoction called lutefisk. What people in America don’t know is that most Norwegians came to their senses decades ago and quit eating the stuff. Lofoten Islands, Norway: Thousands of deceased cod sway in the breeze from drying racks. After this bizarre hazing ritual, they will become lutefisk. To make lutefisk, catch yourself a cod. Take out the bones, skin it, salt it, and hang it out to dry for several weeks until it hardens and smells like a dumpster. Then, bring it inside and soak it in lye for several days. Et cetera indeed. When you use it to make fish, you get a gelatinous blob that slithers down your throat and makes you wish you had cooked a turkey for Christmas dinner like a normal American. Norwegians didn’t invent lutefisk because they thought it was tasty. A long time ago, in the pre-refrigeration epoch, salting and drying fish was an efficient way to preserve it. They soaked it in lye afterward to pull the salt out and — believe it or not — make it more palatable. A century ago, lutefisk really was a staple in the Norwegian diet. Also a century ago, a lot of Norwegians fled the country. Refrigerators have arrived in the Old World, as has the electricity needed to power them. They now have more pleasant ways to keep food fresh. Today, more lutefisk is consumed in Wisconsin than in Norway. Norwegians buy more frozen pizzas per capita than any other nationality. They consume 13,000 tons of frozen pizza annually — an average of more than five and a half pounds of cheesy goodness for every man, woman, and screaming toddler. Yes, frozen pizza is a Norwegian staple food today. Why not get in touch with the 21st century and start a new holiday tradition? I am a proud Norwegian-American, as is my mother, who every year at Christmas bakes about 74 pounds of traditional Norwegian Christmas cookies and other edible things. She never made me eat lutefisk when I was a child. This is because she loves me. 1) On every Scandinavia tour I lead, someone asks me about lutefisk. I tell them how horrible it is, which felt hypocritical since I had never even sniffed the stuff before. 2) I was intoxicated, and my judgment was impaired when I asked to try it. “What is it?” I asked, and drank my akvavit. “Lutefisk,” he laughed, refilling my akvavit glass. 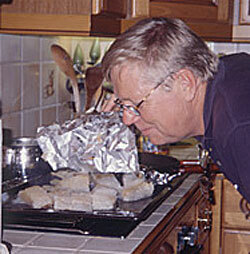 Per sniffs the lutefisk between shots of akvavit. “Are you serious?” I asked, drinking my second shot of akvavit. In the 15 years I have known Per, I had never seen him eat lutefisk before. But I sensed he was serious. The previous summer I had narrowly avoided home-cooked whale by taking him out for Indian food. He didn’t remember the whale steaks thawing in the fridge at home until our curry arrived at the table. This conversation and refilling continued for an hour or so while Per prepared the fish along with the traditional stewed peas and bacon drippings that are used to “enhance the flavor.” At one point, Wibeke, my sister’s girlfriend, knocked at the door. Wibeke ran, very fast, far, far away. All other conversation ceased. “Are you sure?” Tordis asked. Moments before the lutefisk attacked, the evil bone was captured on film, dangling from my fork. 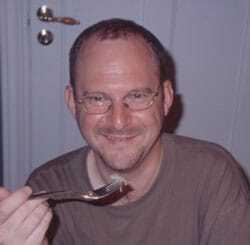 As I held the fork up to my mouth, I got that same sickly feeling you get as you climb aboard a roller coaster, wondering if you are about to become violently nauseous. I wanted to back out but everyone was watching. A quivering glob of what looked like jellyfish dangled menacingly from my fork. Mind over matter, I thought, and shoved it in my mouth, intending to gulp it down so fast, it wouldn’t register on my taste buds. There was a bone. One of those needle-like fish bones that pokes you in the tongue and gets caught between your teeth. I had to dislodge it from my mouth before I could swallow. The lutefisk sat there while I wrestled with the bone. It wrapped itself around my tongue like a lye-flavored python, attacking every taste bud. It might have been my only bite of lutefisk in my life, but it wasn’t going down without a fight. Finally, my mouth was bone-free, and I gulped hard to get the fish down my throat. I had done it! I could now speak from experience when telling people how horrible lutefisk is. And it was. To be completely honest though, it wasn’t as bad as I had expected. It was surprisingly flavorless, with a texture somewhere between Jell-O and mashed potatoes. Nevertheless, I did not ask for a second bite. There are worse culinary traditions in the world. In Athens, a friend once cajoled me into trying chilled sheep’s brain. (“It’s a Greek delicacy,” she said.) In Iceland, specialties include sheep’s testicles, and shark that is buried in the ground for several weeks until it’s rotten. No lye is required. They just dig it up and wash it down with their local firewater, called Black Death. Scotland has haggis, made from a sheep’s stomach lining. In America, we have egg salad sandwiches from vending machines that are kept warm by 40-watt light bulbs for an average of seven months before anyone eats them. (They taste fine as long as you swallow them whole without removing the plastic wrap). So Norway is not the only nation with frightening cuisine. Nevertheless, it saddens me that lutefisk has become representative of my heritage when most Norwegians can’t stand it. The holidays are stressful in many ways, and every year at this time, I see interviews with psychologists warning that not all holiday traditions are good for you. “Move on, and make your own traditions,” they say. So for Norwegian-Americans suffering from lutefisk withdrawal, fret not. It’s time to move into the modern age like the real Norwegians have. I have just returned from the grocery store. I am happy to report there are plenty of frozen pizzas to go around. © Copyright Dave Fox / Globejotting.com. All rights reserved. This article may not be reproduced or transmitted anywhere without written permission from the author. Single copies may e printed for personal use. Looking for more laugh-inducing stories from Norway? Dave Fox’s award-winning travel-humor book, Getting Lost: Mishaps of an Accidental Nomad, includes an entire section on his days as a high school foreign exchange student in the 1980s. From the moment when he was nearly busted in Finland for smuggling ham radio equipment on his way to Norway, to his early, brain-frazzling encounters with the Norwegian language… from his snowmobiling near-catastrophe in the Norwegian mountains, to his tipsy adventures as an American surviving Norway’s high school graduation rituals… and his adventures two years later as a freelance journalist, interviewing drunken nomads and thwarting amorous dentists in the Norwegian far-north, Dave’s book will have you laughing from cover to cover. “When you travel, things go wrong.” That’s been Dave Fox’s travel mantra for many years. Although it might not sound like uplifting advice, Dave proves otherwise in his hilarious debut book that won the Erma Bombeck Writers’ Workshop Book Proposal Contest. Read free sample chapters and order your autographed copy! was plenty. My dad always kept a good supply of Aqavit in the freezer. I am very happy to hear that current day Norwegians are not continuing to choke the stuff down – thanks for a good laugh. In response to your torturous experience with lutefisk, I myself am an american Norwegian, I grew up with it, and love it, never have I needed to choke it down, even when I was a picky 5 yr old back in 1965. I live for the first sighting of it in our local grocery store, usual b/4 thanksgiving, and eat it several times with creamed peas and lefsa….by myself of course!! A friend suggested I read up on what Lutke is and that led me to here (thankfully). I found myself laughing at your experience and descriptions, thank you! My mother would get a big box of lefse from her sister in Western Norway, er, Wisconsin once a year and then run right out and buy a big blob of lutefisk to boil up for about two weeks. My sister and I would grab some lefse and butter and live on it in the backyard for those weeks while our mother inexplicably ate the glop, which I was shocked to learn after several years had actually been fish at one time. I’m not sure what our father did during lutefisk season, but I can’t remember him physically being in the house even once while it was cooking. If I actually came across the stuff nowadays I guess I’d probably try it, in the same spirit in which I have tried sea urchin, chicken feet, and shrimp heads…pure masochism. I absolutely LOVE lutefisk. As soon as it arrives, I buy up as much as I can. Thee most succulent and tasty food in the world!!!! My mouth waters just thinking about it. I, as a Scandinavian decendent here in the U.S., was subjected to Lutfisk once a year in my younger days. I wasn’t sure what to think about it… it was pretty strange. Being of Swedish decent, I had mine boiled in a cheesecloth. I would like to try some of the Norwegian stuff baked in tin foil. I don’t know if it is much better that way, but it certianly couldn’t be much worse, now could it? Actually, I lived in Alaska for several years and ate plenty of Cod. And pickeled Herring too of course. I, as a Scandinavian decendent here in the U.S., I was subjected to Lutfisk once a year in my younger days. I have jubilantly eaten and/or prepared and eaten lutefisk most of the 65 years of my life in honor and salute to my mother’s Norwegian heritage and traditions. In fact, it is a right of passage for anyone thinking about joining the family! It’s acqavit that levels me — drank it once, in serious moderation and spent the next day in bed! you’d probably eat it. most responses to it are WAY over the top. The flavor is actually pretty benign. Essentially tastes like the cod that it is. It does have soft, I guess you’d say gelatinous texture . I just don’t understand what besides the texture there is to be so worked up about. It’s not fermented,old or spoiled. Once, when I was about four years old my Swedish/German grandma (god forgive her) came up to me with a sly smile on her lips and a twinkle in her eyes. And immediately started screaming. In my memory, I hear her maniacally laughing as I spat it into the sink. Lutefisk may be nasty but there’s something worse. Surströmming (Fermented herring, which ferments AFTER it’s sealed in the can, making it BULGE). Some Scandanavian buildings ban serving the stuff indoors because of the hideous stench it gives off. And in Japan, there’s Fugu, that species of puffer-fish with a potent neurotoxin, which means you have to sign an insurance waiver if you want to eat any. It’s the ONE dish in Japan that the Emperor is FORBIDDEN from eating. While watching Chopped on the cooking channel they had lutfisk in one of the baskets. I was wondering what it was so I looked it and found your blog. I have never laughed so much and made ill at the same time. Great write up you have a fantastic since of visualation and taste . loved it. That was hilarious! I’m neither Norwegian nor Swedish- Irish, actually. I asked a Norwegian buddy of mine what lutefisk was and watched him turn an odd share of green as he tried to explain in between dry heaves. He never finished explaining what it was, so I did what everyone else does- ask Google and I found this. Man, I laughed so hard my kids thought they might have to permanently commit their lunatic old man to the mental health facility. Thanks for the laugh! Fantastic article Dave! After reading your article bout Lutefisk, I can almost taste it, lol! It sounds like you have a most colorful family.. Thank you for the laugh today..
I’ve got some bad news for you Chuckles. What you ate was garbage. No Viking in his right mind would touch that stuff. It’s vile. Lutefisk to Vikings was dried cod restored to nearly a fresh state. If it is not like fresh cod. It is NOT Lutefisk. Fish Jello is made by modern idiots who don’t have a clue what they are doing. But don’t feel bad. I grew up with my Grandmother trying to shove that down my throat too. When I became an adult and an amateur scientist I experimented and found the truth. It’s really quite fascinating, what the Vikings achieved that no one knows about today. They could turn dried, hard as a bone fish into fresh fish to eat all winter long. Our ancestors were no dummies.